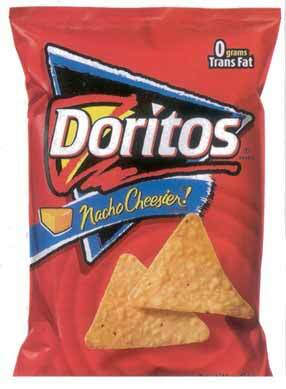 The Part Time Gourmet: Dilemma: What wine to pair with Doritos? Sometimes you want to settle in with a snack and some wine, but don't happen to have any artisan cheese, foie gras and chilled caviar on hand. Bill Daley says this isn't a problem. He asks a number of Chicago-area wine experts for their favorite wine pairings with ordinary, everyday snack foods that might actually have on hand in your house. Doritos with a "big, sloppy" zinfandel works for Tracy Lewis Liang, wine director of Treasure Island foods. Snyder's of Hanover pumpernickel and onion-pretzel sticks with a Carneros pinot noir makes for a happy Robert Owings of Arlington Height's Vintages. Garrett's buttered and cheese popcorn (heated in the oven and drizzled with truffle oil) with any sort of sparkling wine pleases Brian Duncan, wine director of Bin 36 restaurant. And, for me, (Daley) lightly salted goldfish crackers swim winningly with everything from New Zealand sauvignon blanc to California syrah to Spanish Rioja.